About a year ago, I spent around £50 on tombola tickets trying to win a free pass for The Scotch Whisky Experience in Edinburgh. I won in the end. Although, obviously, I didn’t really. A couple of months ago, I used the pass. And since Mr. Malt was on a shopping spree at Homebase, my friend Susie and I decided to go together. I have to say I was expecting just another whisky tour much like you get on a visit to a distillery. Walk around, gaze at some barrels, fondle some barley and peer into some vats. But this was a little different. 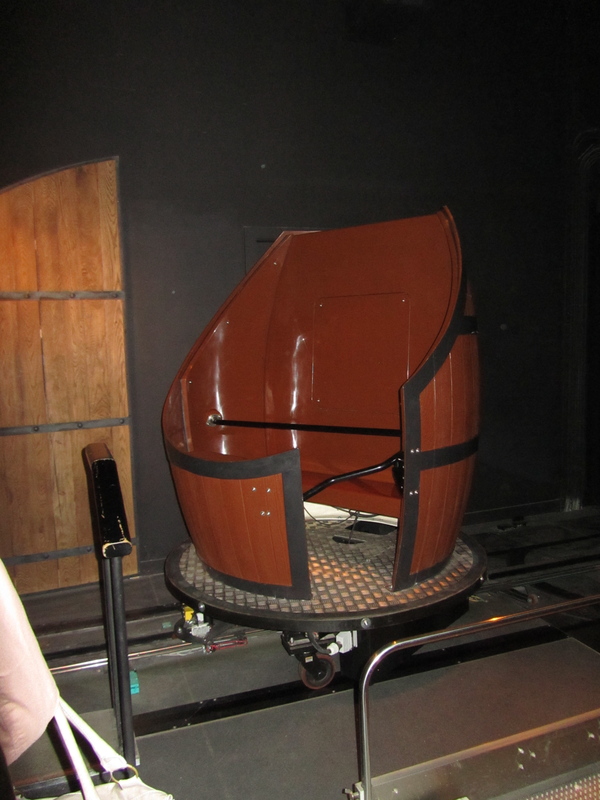 For starters, the tour began with us being allowed to jump the queue for tickets because we had a complimentary pass. High on our VIP-esque buzz, we lined up ready to step into the barrel ride – a cross between the waltzers and the ghost train. You sit in a shiny, painted whisky barrel with its top and side cut out. Then you put your seatbelt on and zip off at half a mile an hour into a tunnel. 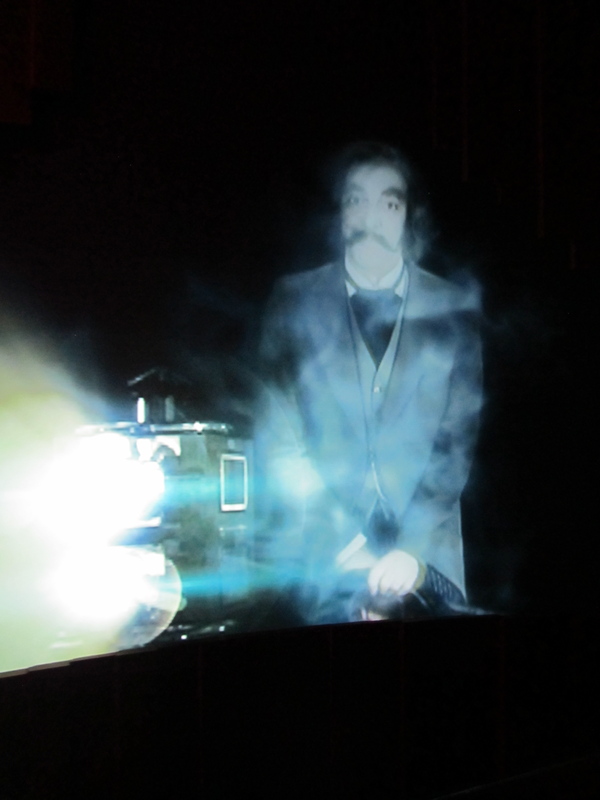 In the tunnel, a digital ghost (digi-ghost) tells you all about whisky production. It’s really quite impressive and the only thing I felt would have enhanced the experience would have been a cup holder with a dram of whisky in. Failing that, some whisky flavoured travel sweets. Or an old, kilted man singing Scottish folk songs. After our dizzying ride, we put our sick bags aside and disembarked from the whisky waltzer, whereupon we were led into the next room for a presentation. The presentation room was a kind of cross between a kibbutz dining hall and a school classroom. Everyone sat at a u-shaped, communal table and faced a massive projection screen, eagerly awaiting stimulation. 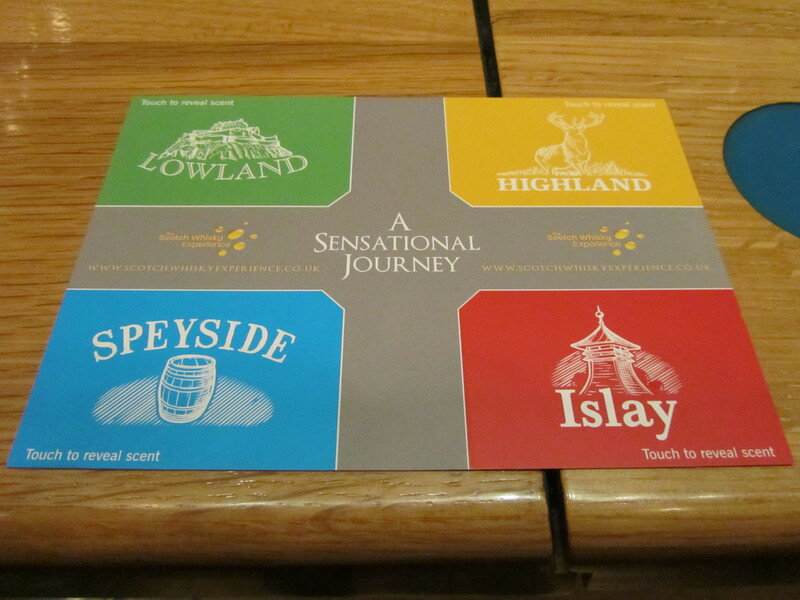 Before the TV show and alcohol we were each given a colourful scratch and sniff card – with one scented segment for each of the four whisky regions in Scotland. Speyside smelt of banana sweets, Islay of smoky, peaty goodness, Highland was sweet and caramelly and Lowland…um.. Lowland smelt of delicious cardboard. What can I say? My card is now several months old, the Lowland bit has lost its scent and I didn’t write anything down at the time. This card was to help inform us in our choice of dram. I loved the novelty of the scratch and sniff idea, although I wasn’t convinced that any of the segments really did whisky justice at all. After the presentation – delivered by a lovely and very well informed lady called Rachel – we got to choose which whisky we wanted to taste. I chose Speyside and was rewarded with a Glenfarclas 10 year old. Susie, a non-whisky drinker- was brave and went straight for the Islay whisky- Ardbeg. She’s single, boys. 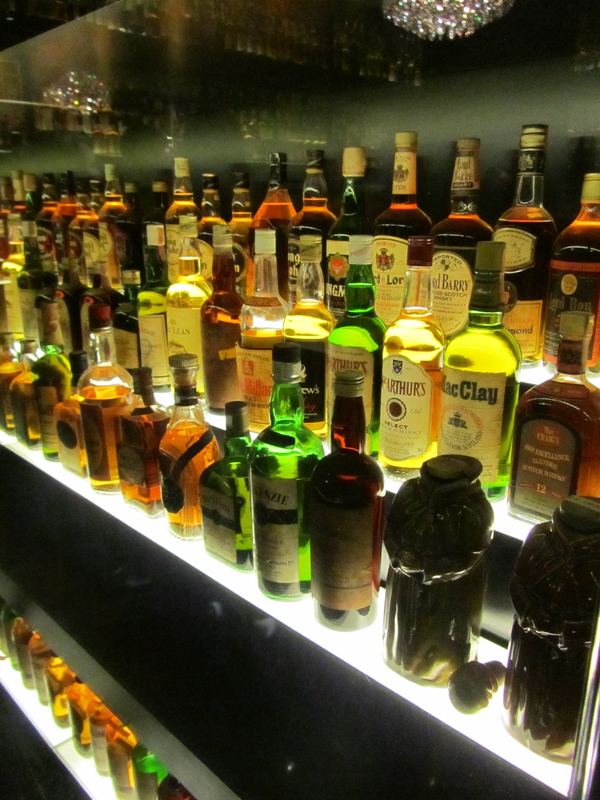 As we sampled our dram we wandered through the world’s largest whisky collection. Over 8000 bottles, all collected by one man, and sold to Diageo for an undisclosed sum, which would no doubt make your eyes water. 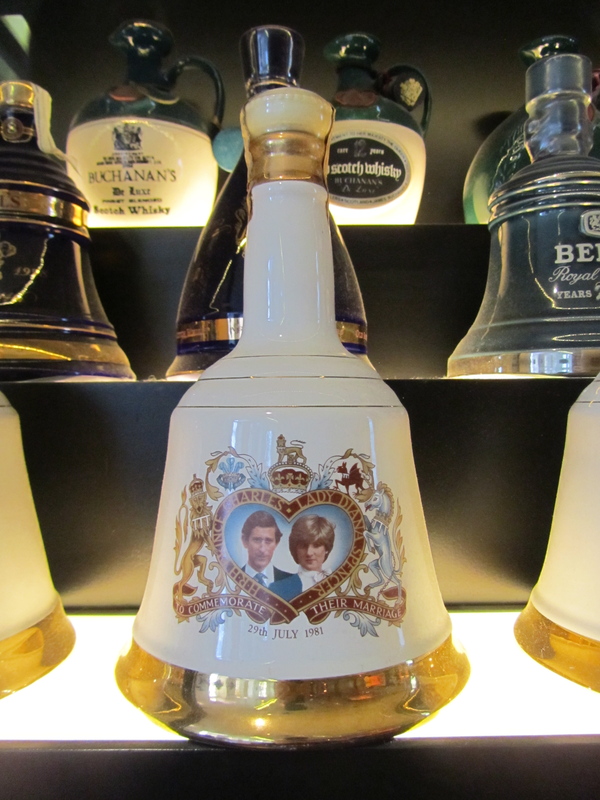 There was even a Charles and Diana commemorative bell, which again made my eyes wet as young Princess Charlotte had arrived in the world that very morning. After our basic package of one whisky had expired, Susie and I upgraded to the gold experience: a platter of four drams from each of the four whisky regions. You can have this all to yourself, but we decided to share – partly because Susie is new to whisky, but mainly because we wanted to make room for cocktails afterwards. 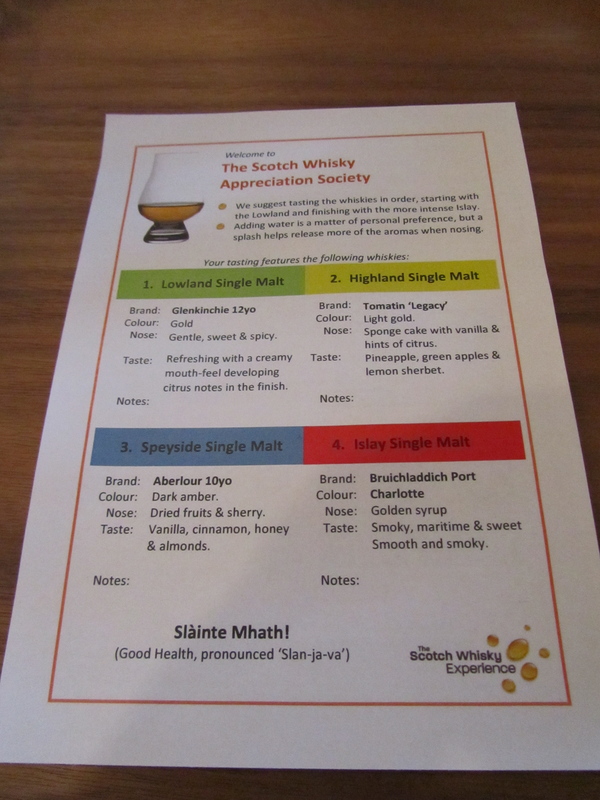 Drinking with a whisky novice, I suddenly subsumed the role of tasting guide and presented the whiskies to Susie as if I knew what I was talking about. “Now the first whisky we are going to try is a Glenkinchie,” I burbled. “Glenkinchie is a distillery in the Lowland region of Scotland… “ And so on, through Tomatin (Highland) Aberlour (Speyside) and Bruichladdich (Islay). We both agreed on the Bruichladdich as our favourite, Susie clearly getting the hang of the big peaty lads very, very quickly. Susie’s face at one of the other whiskies – which shall remain nameless- was that of utter disgust. And looking around the room, there were some other women making the same disgusted face as they took a sip of the dram in front of them. 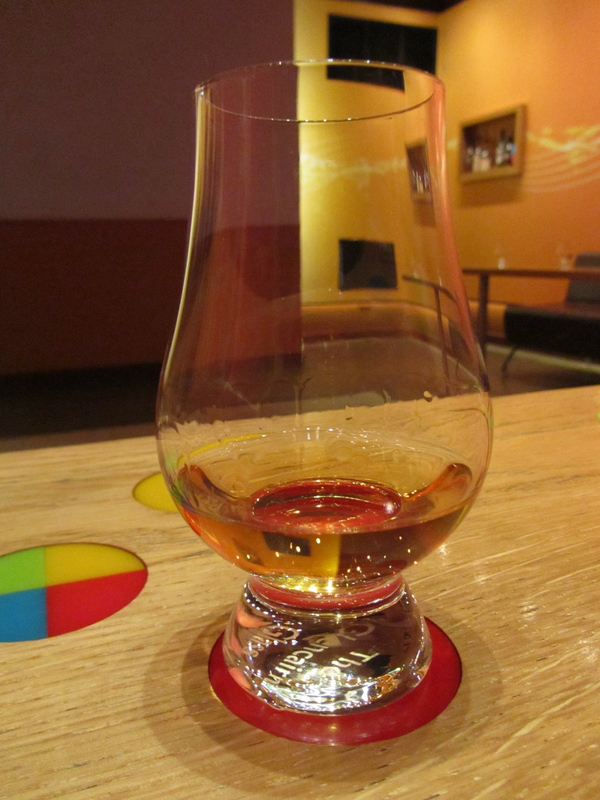 It made me realise how far I have come in developing a palate for whisky. And at £50 for the tickets, just how far I will go to get my hands on some. © www.singlemaltfemale.co.uk, (2015). Unauthorized use and/or duplication of this material without express and written permission from this blog’s author and/or owner is strictly prohibited. Excerpts and links may be used, provided that full and clear credit is given to www.singlemaltfemale.co.uk with appropriate and specific direction to the original content. Independent Bottlers of 'Highland Laird' Single Malt Scotch Whisky. UK Outlet for 'Malts of Scotland'. Premium & Rare Whisky. Exposing the myths, monsters and misogyny. Returning the VERY BEST Charity Shop CRAP to its grieving owners!